Kegel’s Inn - Milwaukee's Most Authentic German Cuisine! DISCOVER ONE OF MILWAUKEE’S HIDDEN GEMS! 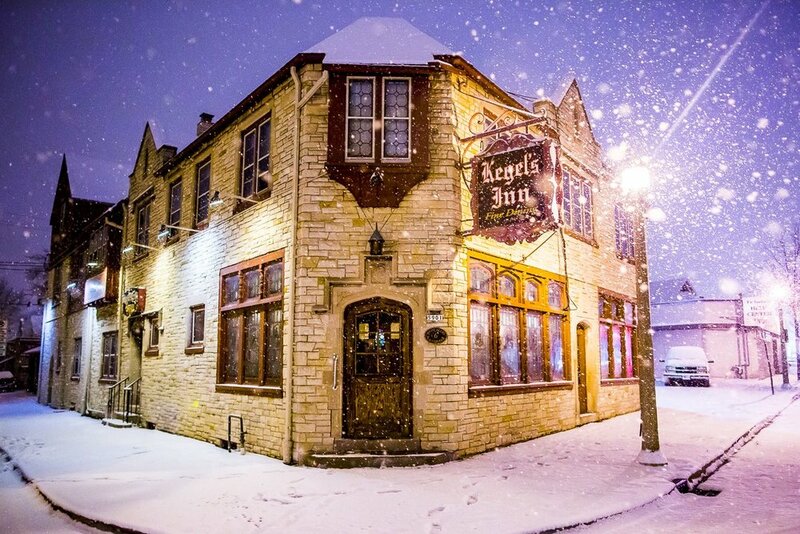 Located in the heart of Milwaukee's West Allis neighborhood, Kegel's Inn serves up the most authentic German cuisine, where everything is made from time honored traditional family recipes. Inside you'll find a warm atmosphere, friendly service and one of the most beautiful beer halls in the country. With incredible hand painted murals, original leaded glass windows, and heavy wooden beams, one can almost hear rounds of "Du Bist Mein Herzen" reverberating in the Bierstube. Since 1924, Kegel's Inn has been the locals' go-to destination for authentic German cuisine and continues to top the charts as one of the best places to catch a Friday Fish Fry in Milwaukee. Read all of our Google reviews. Turn right on W National Ave.
Take exit 307B (on the right) to Hawley Rd. Turn right on S. Hawley Rd. Turn Left on W National Ave. Although reservations are not required, we always appreciate when you call ahead. WHAT ABOUT FRIDAY FISH FRY? UPDATE! - Due to high demand for Friday Fish Fry and the upcoming Lenten season, we will not be accepting parties larger than 7 people! Yes, even with our small dining area, we do accept a few reservations every Friday, however, it is very unlikely to get a reservation during busy hours by calling the same day. Reservations between 5:00 and 7:30pm usually fill up at least a week out. Not to fear, we do save plenty of room to walk-in and we serve till 10pm! NO WORRIES! I'D RATHER WALK-IN! Walk all the way to the end of the bar and give your name and party size to Julian Kegel. Enjoy the great selection of German Beers and Classic Supper Club Cocktails from one of the lovely bartenders. Spend your time noticing the friendliness and good cheer. Allow your senses to notice the authenticity of your surroundings. Kegel's is a 1924 prohibition-era speakeasy. Revel in the craftsmanship of our original murals, the intricate woodwork and gorgeous leaded stained glass windows. 5 - Rejoice when your name is called. Getting a table is a little bit like Yahtzee, so make sure you cheer accordingly! Although we love the dining experience at Kegel's Inn, we understand a meal in the comfort of your own home can be just as enticing after a long day. Kegel's Inn has a long, rich history of entertaining large parties. With a dining room that seats up to 100 guests*, our customizable dining room is perfect for birthdays, wedding rehearsals, holiday parties, business meetings, anniversaries, graduations, school field trips, memorial luncheons and so much more! *No minimum for booking during normal kitchen hours. AIRBNB - STAY WITH US! Apartment #3 is good for two people looking to enjoy a quaint studio with lots of old world character! Apartment #5 sleeps 6 people in an updated 2-bedroom and a huge kitchen with plenty of room to spread out! Tell your friends to stay with us next time they visit and they will receive a $20 Gift Card for staying with us for 3 days or more!